Objectives: The main objective of the present study was to assess efficacy and safety of AHPL/AYTOP/0113 cream, a polyherbal formulation in comparison with Framycetin sulphate cream in acute wounds. Methodology: It was an open label, randomized, comparative, parallel group and multi-center clinical study. Total 47 subjects were randomly assigned to Group-A (AHPL/AYTOP/0113 cream) and 42 subjects were randomly assigned to Group-B (Framycetin sulphate cream). All the subjects were advised to apply study drug, thrice daily for 21 days or up to complete wound healing (whichever was earlier). All the subjects were called for follow up on days 2, 4, 7, 10, 14, 17 and 21 or up to the day of complete wound healing. Data describing quantitative measures are expressed as mean ± SD. Comparison of variables representing categorical data was performed using Chi-square test. Results: Group-A subjects took significantly less (P < 0.05) i.e., (mean) 7.77 days than (mean) 9.87 days of Group-B subjects for wound healing. At the end of the study, statistically significant better (P < 0.05) results were observed in Group-A than Group-B in mean wound surface area, wound healing parameters and pain associated with wound. Excellent overall efficacy and tolerability was observed in subjects of both the groups. No adverse event or adverse drug reaction was noted in any subject of both the groups. Conclusion: AHPL/AYTOP/0113 cream proved to be superior to Framycetin sulphate cream in healing of acute wounds. Acute wounds are usually tissue injuries that heal normally in a short duration with minimal scarring if right treatment is given. Chronic wounds go through portions of repair process without establishing functional anatomic results.,,, Many oral and topical conventional medicines are available in the market which have been used to prevent wound contamination and to promote wound healing. Conventional treatments include local anti-septic agents and antibiotics. Antiseptic agents include hydrogen peroxide, chlorhexidine, triclosan, iodophors (povidon iodine). Antibiotics include aminoglycosides (viz., Framycetin, Neomycin, etc.) and Polymyxin B, Bacitracin, etc., These remedies prevent wound infection, help to keep wound clean, but these remedies do not possess wound healing property. Also, most of the remedies have minor side effects and drawbacks such as skin irritation, rash, and antibiotic resistance.,, These facts about conventional remedies motivate medical practitioners and patients to use alternative medicines. In primary skin irritation (safety) study conducted as per OECD guidelines No. 402, AHPL/AYTOP/0113 cream was found to be safe for topical application in rats. In experimental studies, AHPL/AYTOP/0113 cream showed good wound healing activity in the excision and incision wound models in normal as well as diabetic rats as compared to other herbal creams, placebo cream, Framycetin sulphate cream, Mupirocin cream and Jātyādi oil. Also, in other experimental studies, AHPL/AYTOP/0113 cream showed significant better wound healing activity in burn wound models in normal as well as diabetic rats as compared to other herbal creams, placebo cream, Jātyādi oil and silver sulfadiazine cream.,, Based on the data available on AHPL/AYTOP/0113 cream, a hypothesis was made that the drug is effective and safe in the treatment of acute traumatic skin wounds. To test the hypothesis, the present clinical study was conducted. It was an open labeled, randomized, comparative, parallel group, multi center, prospective, interventional clinical trial. Primary objective was to evaluate efficacy of AHPL/AYTOP/0113 in comparison to Framycetin sulphate cream by assessment of time required (in days) for complete wound healing. Secondary objectives were to evaluate efficacy of AHPL/AYTOP/0113 in comparison with Framycetin sulphate cream by evaluating wound healing process on each visit and at the end of the study by comparing the mean surface area of acute wounds using trace paper method, by evaluating wound healing parameters such as wound depth, wound edges, wound exudates, skin appearance around the wound, peripheral tissue edema and induration, granulation of wound and epithelialization of wound. Also, the secondary objectives were to assess clinical global evaluation for overall improvement by physician and by the patient himself/herself, drug compliance and assessment of pain on VAS score. The other secondary objectives were to evaluate safety of AHPL/AYTOP/0113 in comparison with Framycetin sulphate cream by assessing tolerability of study drugs and by assessing the adverse events and/or adverse drug reactions at the end of the study. A total of 104 patients suffering from acute wound were screened for the study. 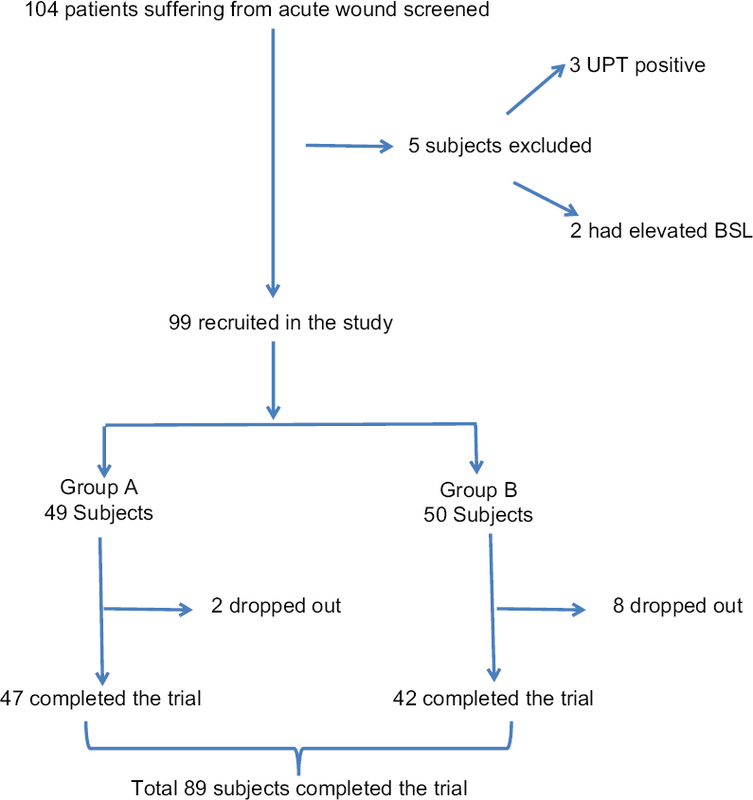 Out of 104 screened patients, 99 patients were recruited in the study. Out of 99 recruited subjects, 89 completed the study. Healthy male and female subjects of 18 to 50 years age, willing to follow study procedures mentioned in protocol and voluntarily willing to sign the informed consent forms were included in study. Subjects having acute partial or full thickness skin wounds (<6 hours of occurrence) and having wound area between ≥1.0 and ≤16.0 cm2 were included in the study. Subjects who were willing to take injection TT before application of study drug (if he/she had not taken injection TT in last 6 months) and willing to make all required study visits were included in the study. Pregnant, lactating women and women of child bearing age, who refused to use effective contraceptive methods, were excluded from the study. Subjects with moderate to severe bacterial/fungal infection and with known immunological, hematological, neurological, psychiatric pathologies, HIV/AIDS or having metastatic malignancy, known hypersensitivity to trial medicines or their components, alcoholics and smokers were excluded from the study. Subjects, who needed primary closure (by suturing) or dressing of wound and who had severe edema on the affected area were excluded from the study. Subjects who had used local or oral medicines for treatment of wound within 6 hours prior to screening/baseline visit, using NSAIDs, antibiotics (systemic or topical) or cytotoxic drugs (systemic) or who had received treatment with glucocorticoids for >10 consecutive days within 6 months prior to screening/baseline visit, received chemotherapy or radiation therapy within the past 5 years from screening/baseline visit, and received treatment (another investigational agent) within last thirty (30) days from screening/baseline visit were excluded from the study. Subject was withdrawn from the study in case of any life threatening illness or adverse event and/or noncompliance with the study medication and/or repeated protocol violation. The investigational product i.e., AHPL/AYTOP/0113 cream was manufactured by the sponsor i.e., Ari Healthcare Pvt. Ltd., following GMP and all applicable regulatory guidelines. The composition of the drug is given in [Table 1]. The comparator drug i.e., Framycetin sulphate cream (1% w/w) [Aventis Pharma, Goa] was procured from the market and provided to the study sites. The study was conducted at Site-1: Kamthe Hospital, Dighi, Pune; Site-2: Lokmanya Medical Research Centre and Hospital, Chinchwad, Pune-33 and Site-3: MAM's SS Ayurveda Mahavidyalaya and Sane Guruji Aarogya Kendra, Malwadi, Hadapsar, Pune-28. Subjects attending OPD clinic/causalty department at above trial sites were selected for study. On screening/baseline visit (day 0), subject's voluntary written informed consent was taken. Subject's demographic data, detailed medical history along with the current medications (if any) were noted. Subject's general and systemic examinations were done on every visit. Subjects were inquired about details of wound (cause, duration, treatment for wound etc.). If there were multiple wounds or cuts, only one wound/cut appropriate in size was considered as index wound and was followed up till the end of the trial or till complete wound healing (whichever was earlier). Other wounds/cuts were treated with given investigational product but not considered for assessment purpose. On screening/baseline visit, wound examination was done by an investigator/co-investigator. The wound area was assessed by using transparent trace paper and marker pen with all aseptic precautions. Subjects with partial or full thickness skin wounds and wound area between ≥1.0 and ≤16.0 cm2 were selected for study. On every visit, the wound healing measures (depth/thickness, edges, potential exudate, surrounding skin appearance, peripheral tissue induration, peripheral tissue edema, granulation of wound and epithelialization of wound) were assessed. Pain assessment was done on Visual Analogues Scale (VAS). Photographs of the wound were taken. On screening/baseline visit, all the subjects were assessed as per inclusion and exclusion criteria. Subject's detailed medical and surgical history was recorded. Subjects were also asked for any episodes of hospitalization in the past to exclude the cases with known immunological, hematological, neurological, psychiatric pathologies or having metastatic malignancy. Urine pregnancy test (UPT) of all female subjects of reproductive age was done. All the subjects were advised to undergo random blood sugar (RBS) level estimation. ELISA test for HIV (I, II) was performed. If subject fulfilled all inclusion/exclusion criteria, he/she was included in the study. As per the computer generated randomization list, subject was randomized to one of the two study groups i.e., Group A ('AHPL/AYTOP/0113') or Group B (Framycetin sulphate cream). On screening/baseline visit and during whole study period, study subjects were advised to refrain from NSAIDs, oral and topical antibiotics and other topical medications [except tablet paracetamol as a rescue medication up to 2 gm/day for pain management]. Subjects were advised to get the wound cleaned (using saline/distilled water) by the investigator/co-investigator before applying cream on the wound area. Also, subjects were given single dose of injection TT before application of investigational product (if he/she had not taken injection TT in last 6 months). On screening/baseline visit, subjects from Group A received Lami tubes containing 15 gm of AHPL/AYTOP/0113 cream whereas subjects from Group B were received Lami tubes containing 20 g of Framycetin sulphate cream. Subjects in Group A were advised to apply sufficient quantity of AHPL/AYTOP/0113 cream on wounds and cuts thrice daily for 21 days or till complete wound healing (whichever was earlier) and subjects from Group B were advised to apply sufficient quantity of Framycetin sulphate cream on wounds and cuts thrice daily for 21 days or till complete wound healing (whichever was earlier). If needed, subjects were given extra tubes of medicine on follow up visits. All the subjects were advised to continue their routine diet and exercise regimen (which they had been already following) during the entire study. Subjects were provided a dose chart (in the languages best understood by subjects) to keep daily record of application of cream. On screening/baseline visit, all the subjects were closely monitored for any adverse events after the first application of trial medications. All the activities and findings were documented in the CRF. Drug compliance was assessed by the investigator/co-investigator on every follow up visit. Dose chart provided to the subject on the previous visit was collected and dose chart was checked for missed dosage. After checking, the dose chart was returned to study subject. As per the dose chart, if study medication was applied ≥80% time, the subject was considered compliant. If study medication was applied ≤80% of time, the subject was considered as non-compliant. All the subjects were closely monitored for any adverse events, starting from screening visit up to the end of the study. If the wound healing occurred in between the two visits, the subjects were advised to visit the study site without waiting for next follow up visit to record the day of wound healing. At the end of the study i.e., on the day of wound healing or day 21 (whichever was earlier), global assessment of overall improvement was done by the investigator and by the subject. Acceptability/tolerability of trial drugs was assessed by the investigator and subject. At the end of the study, all the trial subjects were asked to stop applying trial medications and take advice of investigator. If the wounds and cuts did not heal completely after continuous application of creams for 21 days, the further management was done according to the decision of investigator/co-investigator. All the activities and findings were documented in the CRF. Before initiation of the study, the study protocol and related documents were reviewed and approved by the Independent Ethics Committee (IEC) of Dhanashree Hospital, Navi Sangvi, Pune-25; Institutional Ethics Committee (IEC) of Lokmanya Medical Research Centre and Hospital, 314/B, Telco Road, Chinchwad, Pune-33 and Institutional Ethics Committee (IEC) of MAM's SS Ayurveda Mahavidyalaya, Malwadi, Hadapsar, Pune-28, India. The study was conducted in accordance with good clinical practices (GCP) guidelines (issued by AYUSH in 2013), Schedule 'Y' of Drugs and Cosmetics Act, India, amended in 2005 and ICMR ethical guidelines for biomedical research on human participants, which are based on WMA-Declaration of Helsinki. Also, the clinical trial was registered prospectively on website of Clinical Trial Registry of India (CTRI), on 13/01/2014. The CTRI number for the trial is CTRI/2014/01/004304. Consultant statistician performed the analysis of the data using statistical software SPSS 10.0. Data describing quantitative measures are expressed as median or mean ± SD or SE or the mean with range. Qualitative variables are presented as counts and percentage. Comparison of variables representing categorical data was performed using Chi-square test. Mean assessment of pain was calculated and tested by using analysis of variance with Kruskal Wallis test. Allp- values are reported based on two-sided significance test and all the statistical tests are interpreted at 5% level of significance. Out of 104, 89 subjects completed the trial, 65 (73.03%) were males, while 24 (26.97%) were females. The mean age of subjects of Group A was 28.96 ± 09.14 years and the mean age of the subjects from Group B was 29.88 ± 10.58 years. The age range for subjects of Group A was 18 to 57 years, while 18 to 59 years was the age range of subjects of Group B. The mean height of subjects from Group A was 158.76 ± 05.66 cm and the mean height of subjects from Group B was 158.50 ± 07.69 cm. No statistically significant change from baseline to end of therapy values in any of the vital signs (pulse rate, body temperature, and respiratory rate, systolic and diastolic blood pressure) and body weight was observed among both the groups. The mean random blood sugar (RBS) level was 103.21 ± 12.90 mg/dl among subjects in Group A, whereas the mean random blood sugar level was 108.62 ± 14.79 mg/dl among subjects in Group B. The difference in RBS level was statistically insignificant. The mean time required for complete healing of wound was 7.77 ± 01.55 days in subjects from Group A, while it was 9.87 ± 1.82 days in subjects from Group B. 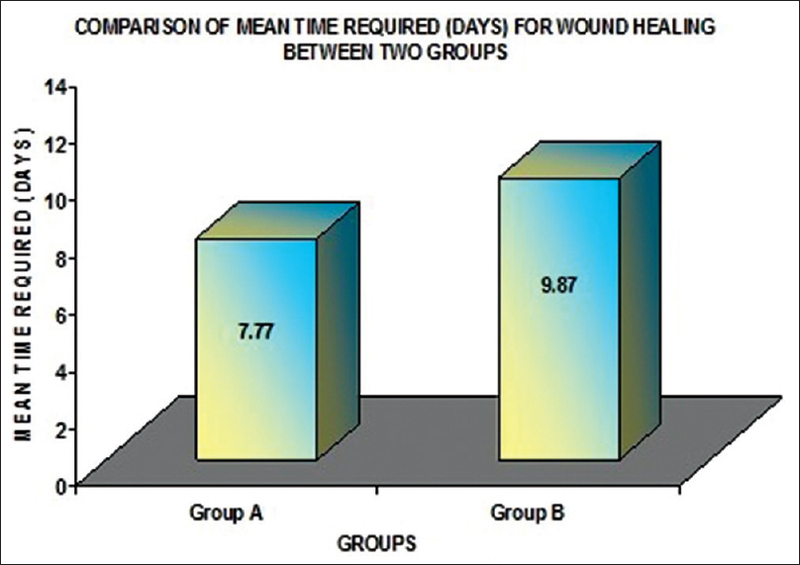 When compared between groups, subjects from Group A required significantly lesser number of days for complete wound healing as compared to subjects from Group B. The details are presented in [Figure 1]. At baseline visit, the mean wound surface area was 03.17 ± 02.87 cm 2 among subjects of Group A, whereas the mean wound surface area was 03.98 ± 03.45 cm 2 among subjects of Group B. The difference between both groups was statistically insignificant. In Group A, the mean wound surface area reduced from baseline value to 02.84 ± 02.55 cm 2, 01.89 ± 01.82 cm 2, 00.20 ± 00.47 cm 2 on days 2, 4 and 7 respectively which correspond to 10.4%, 40.4, 93.7% reduction in the mean wound surface area. In Group B, the mean wound surface area reduced from baseline value to 03.66 ± 03.08 cm 2, 02.60 ± 02.57 cm 2, 01.39 ± 01.45 cm 2 on days 2, 4 and 7 respectively which correspond to 8.0%, 34.7%, 65.1% reduction in the mean wound surface area. The difference between two groups was statistically insignificant. On day 10, it was observed that there were 5 subjects remaining in Group A, whose wounds were not completely healed, while the corresponding number in Group B was 26. In Group B, the mean wound surface area reduced from baseline value to 00.50 ± 0.71 cm 2 on day 14. The details are given in [Table 2]. The wound depth was measured on a graded scale viz., grade-1 = non-blanchable erythema on intact skin; grade-2 = partial thickness loss involving epidermis and or dermis; grade-3 = full thickness skin loss involving damage or necrosis of subcutaneous tissue; grade-4 = obscured by necrosis; and grade-5 = full thickness skin loss with extensive destruction, tissue necrosis or damage to muscle, bone or supporting structures. When compared from baseline, statistically significant improvement in wound depth was observed in both the groups on days 4 and 7. When compared between groups, statistically significant improvement in wound depth was observed in Group A than in Group B. On day 10, it was observed that 42 subjects in Group A had completely healed wounds, whereas 16 subjects in Group B had completely healed wounds with non-blanchable erythema on intact skin. The wounds of all the subjects in Group A were healed completely before day 14 and all subjects in Group B had completely healed wounds on day 14 with non-blanchable erythema on intact skin. No subject of either group was having grade-3, grade-4 or grade-5 wound depths during entire study period. The details are presented in [Table 3]. Wound edges were measured on a graded scale viz., grade-1 = indistinct, diffuse, none clearly visible; grade-2 = distinct, outline clearly visible, attached, even with wound base; grade-3 = well-defined, not attached to wound base; grade-4 = well-defined, not attached to base, rolled under, thickened; and grade-5 = well-defined, fibrotic, scarred or hyper-keratotic. When compared to baseline values, statistically significant difference in wound edges was observed in both the groups on days 4 and 7. When compared between groups, statistically significant better healing in wound edges was observed in Group A than in Group B. On day 10, it was observed that 42 subjects in Group A and 16 subjects in Group B had completely healed wounds with indistinct, diffuse or none clearly visible wound edges. The wounds of all the subjects in Group A was healed completely before day 14 whereas two subjects in Group B had wounds with indistinct, diffuse or none clearly visible wound edges on day 14. Not a single subject from both the groups was having grade-4 or grade-5 wound edges during the entire study period. The details are presented in [Table 4]. Wound exudate types were graded as grade-1 = none; grade-2 = bloody exudate; grade-3 = serosanguineous, thin, watery, pale red/pink exudate; grade-4 = serous: thin, watery, clear; and grade-5 = purulent, thin or thick, opaque, tan/yellow exudate with or without odor. When compared from baseline values, statistically significant difference in exudate types was observed in both the groups on days 2, 4 and 7. When compared between groups, Group A had statistically significant better results than Group B. On day 10, all (100.0%) the subjects in Group A and 95.24% subjects in Group B had no wound exudate whereas 4.76% the subjects in Group B had bloody exudate. On day 14, all subjects in Group B had no wound exudate. Not a single subject from both the groups was having purulent exudate during the entire study period. The details are presented in [Table 5]. Wound exudates were measured on a graded scale viz., grade-1 = none, dry wound; grade-2 = scanty (wound moist) but no observable exudate; grade-3 = little exudate; grade-4 = moderate exudate; and grade-5 = large amount of exudate. From baseline, statistically significant difference in wound exudate amount was observed in both the groups on days 2, 4, 7 and 10. When compared between groups, Group A had statistically significant better results than Group B. On day 10, all (100.0%) the subjects of Group A and 97.62% subjects of Group B had no exudate with complete healing of wound. On day 14, all the subjects of Group B had no exudate with complete healing of wounds. The details are presented in [Table 6]. Skin appearance surrounding the wound was assessed on a graded scale viz., grade-1 = pink or normal for ethnic group; grade-2 = bright red and/or blanches to touch; grade-3 = white or grey pallor or hypo pigmented; grade-4 = dark red or purple and/or non-blanchable; and grade-5 = black or hyper-pigmented. 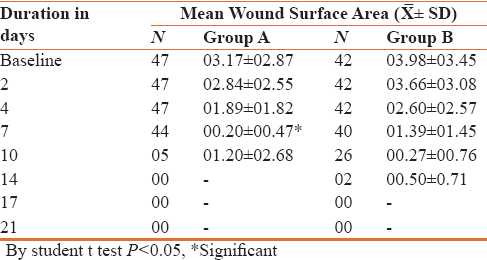 From baseline, statistically significant difference in skin appearance (surrounding the wound) was observed in Group A than Group B on days 4 and 7. When compared between groups, Group A had statistically significant better results than Group B. On day 10, it was observed that 42 subjects in Group A had completely healed wounds, whereas 16 subjects in Group B had completely healed wounds with pink or normal skin appearance. The wounds of all the subjects in Group A had healed completely before day 14 and those in Group B had completely healed wounds on day 14 with pink or normal skin appearance. The details are presented in [Table 7]. Peripheral tissue swelling/edema was measured on a graded scale viz., grade-1 = none present; grade-2 = induration <2 cm around wound; grade-3 = induration 2-4 cm extending <50% around wound; grade-4 = induration 2-4 cm extending >50% around wound; and grade-5 = induration >4 cm in any area around wound. From baseline, statistically significant difference in peripheral tissue swelling/edema was observed in both the groups on days 2, 7 and 10. When compared between groups, Group A had statistically significant better results than Group B. On day 10, it was observed that 42 subjects in Group A had completely healed wounds, whereas 16 subjects in Group B had completely healed wounds with no swelling/edema. The wounds of all the subjects in Group A had healed completely before day 14 and those in Group B had completely healed wounds on day 14 with no swelling/edema. Not a single subject in both groups was having grade-3 or grade-4 swelling/edema around the wound during the entire study period. The details are presented in [Table 8]. Peripheral tissue induration was measured using a graded scale viz. grade-1 = none present; grade-2 = induration <2 cm around wound; grade-3 = induration 2-4 cm extending <50% around wound; grade-4 = induration 2-4 cm extending >50% around wound; and grade-5 = induration >4 cm in any area around wound. From baseline visit, statistically significant difference in tissue indurations was observed in both the groups on days 7 and 10. When compared between groups, Group A had statistically significant better results than Group B. On day 10, it was observed that 42 subjects in Group A had completely healed wounds, whereas 16 subjects in Group B had completely healed wounds with no peripheral tissue indurations. The wounds of all the subjects in Group A were healed completely before day 14 and all the subjects in Group B had completely healed wounds on day 14 with no peripheral tissue indurations. None of the subjects in either groups had grade-4 or grade-5 peripheral tissue indurations during the entire study period. The details are presented in [Table 9]. Granulation tissue was measured using a graded scale viz., grade-1 = skin intact or partially thick wound; grade-2 = bright, beefy red, 75% to 100% of wound filled and/or tissue overgrowth; grade-3 = bright, beefy red, <75% and >25% of wound filled; grade-4 = pink, and/or dull, dusky red and/or fills <25% of wound; and grade-5 = no granulation tissue present. Improvement in healing of wounds was observed in both the groups on days 2, 4 and 7. When compared between groups, no statistically significant difference regarding granulation tissue was observed. On day 10, it was observed that 42 subjects in Group A had completely healed wounds, whereas the number was 16 for Group B. The wounds of all the subjects in Group A had healed completely before day 14 and all the subjects in Group B had completely healed wounds on day 14. The details are presented in [Table 10]. Wound epithelialization was measured on a graded scale viz. grade-1 = 100% wound covered, surface intact; grade-2 = 75% to <100% wound covered and/or epithelial tissue extends >0.5 cm into wound bed; grade-3 = 50% to <75% wound covered and/or epithelial tissue extends to <0.5cm into wound bed; grade-4 = 25% to <50% wound covered; and grade-5= <25% wound covered. From baseline visit, statistically significant improvement in wound epithelialization was observed in both the groups on day 7. When compared between groups, the difference was statistically insignificant. On day 10, it was observed that 42 subjects in Group A had completely healed wounds, whereas 16 subjects in Group B had completely healed wounds. The wounds of all the subjects in Group A were healed completely before day 14 and all subjects in Group B had completely healed wounds on day 14. The details are presented in [Table 11]. Pain associated with wound was assessed by using Visual Analog Scale (VAS). Initially at baseline visit, the mean VAS score was 83.04 ± 08.91 and 78.05 ± 11.00 in subjects of Group A and Group B respectively. In Group A, the mean VAS score reduced from baseline to 63.48 ± 12.69, 34.13 ± 14.23 and 05.33 ± 11.79 on days 2, 4 and 7 respectively. In Group B, the mean VAS score reduced from baseline to 65.12 ± 13.44, 44.63 ± 14.85 and 21.28 ± 14.90 on days 2, 4 and 7 respectively. Though the reduction in the mean VAS score was more in Group A, the difference between groups was statistically insignificant on day 2 but significant on day 4 and 7. In Group A, the mean VAS score was 08.00 ± 17.89 on day 10. In Group B, the mean VAS score was 5.38 ± 12.40 on day 10. The difference between groups was statistically insignificant. From day 10 onwards there was no pain in any subject in both the groups. The details are presented in [Table 12]. As per the global assessment for overall improvement done by the physician at the end of the study, 100% of study cases among Group A had excellent improvement, whereas 92.9% cases among Group B had excellent improvement and 7.1% cases had good response to the study treatment. As per the global assessment for overall improvement done by the patients at the end of the study, 100% of study cases among Group A had excellent improvement, whereas 92.9% cases among Group B had excellent improvement and 7.1% cases had good response to the study treatment. The difference between the groups was statistically insignificant. As per the global assessment of drug tolerability done by the physician and patient, 100% of study cases in both the groups had excellent tolerability to the treatment given, which was comparable and the difference between the groups was statistically insignificant. No adverse events or adverse drug reactions were observed in any of the subjects of either group. In the present clinical study, AHPL/AYTOP/0113 cream was compared with Framycetin sulphate cream in acute wounds. In the present clinical study, it has been observed that subjects from Group A required mean 7.77 days for complete wound healing which was significantly less as compared to mean 9.87 days required for complete wound healing of Group B subjects [Figure 2]. This indicates that drug AHPL/AYTOP/0113 scored over Framycetin sulphate cream in the management of acute wounds. At the end of 7th day of treatment, 93.7% reduction in the mean wound surface area was noted among Group A subjects, which was significantly more as compared to 65.1% reduction in the mean wound surface area among Group B subjects. Statistically significant better result was observed in Group A than Group B in wound healing parameters viz. wound depth, wound edges, exudates, amount of wound exudates, skin appearance surrounding the wound, peripheral tissue swelling/edema, peripheral tissue induration, granulation tissue, wound epithelialization and pain associated with wound. At the end of the study, according to physician's and patient's assessment for overall efficacy, excellent overall efficacy was observed in 100% subjects of Group A, whereas excellent overall efficacy was observed in 92.9% subjects of Group B. Good response was observed in 7.1% subjects of Group B. Though the difference between two groups was statistically insignificant, 'AHPL/AYTOP/0113' cream scored over 'Framycetin Sulphate Cream' for the treatment of acute wounds. Experimental studies using incision, excision and burn wound models in normal as well as diabetic rats were conducted.,, The results of the studies suggest that 'AHPL/AYTOP/0113' cream is better wound healing agent than Framycetin sulphate cream, Mupirocin Cream and Silver sulfadiazine cream. These results of 'AHPL/AYTOP/0113' cream against Framycetin sulphate are confirmed in the present clinical trial. At the end of the study, according to physician's and patient's assessment for tolerability of study drugs (i.e. AHPL/AYTOP/0113 and Framycetin Sulphate Cream) excellent tolerability was observed in all (100%) subjects of Group A and Group B. No adverse event or adverse drug reaction was noted in any of the subjects of both the groups. Hence testifying its safety in human subjects. In skin irritation study, AHPL/AYTOP/0113 cream has been found to be safe for topical application in experimental rats. The results of skin irritation study have also been confirmed in humans. The results of the present clinical study are highly encouraging. Though it has been established that AHPL/AYTOP/0113 cream is effective and safe in acute wounds, it is recommended to conduct randomized, multi-centric clinical study in slow healing diabetic ulcer patients. Also, the efficacy of AHPL/AYTOP/0113 cream should be evaluated against Mupirocin cream as a standard drug, which is having a broader spectrum activity than Framycetin sulphate cream. The present study provides evidence in support of the potential efficacy and safety of AHPL/AYTOP/0113 cream as a natural wound healing agent. AHPL/AYTOP/0113 cream proved to be superior to Framycetin sulphate cream in healing of acute wounds. Hence, it can be concluded that AHPL/AYTOP/0113 cream can be a better alternative than Framycetin sulphate for healing of acute wounds. The authors sincerely thank all staff of the trial sites viz. Lokmanya Medical Foundation and Research Centre, Chinchwad, Pune-33; Sumatibhai Shah Ayurved Mahavidyalaya, Malwadi, Hadapsar, Pune-28; and Kamthe Hospital, Survey No. 73, Sambhajiraje Chowk, Adarsh Nagar, Dighi, Pune-15 for their contribution in the conduct of present clinical study. The authors also sincerely thank Mr. Kailas Gandewar, Biostatistician, Soham Consultancy, Dadar, Mumbai for his kind help in sample size calculation and data analysis for the study. The authors are extremely grateful to Mr. Sanjeevan Kanjilal (Managing Director) and Dr. Anisha Kanjilal (Director) of Ari Healthcare Pvt. Ltd., for providing all the research facilities, guidance and moral support. This study was financially supported by Mr. Sanjeevan Kanjilal (Managing Director) and Dr. Anisha Kanjilal (Director) - Ari Healthcare Pvt. Ltd., Pune, Maharashtra, India. Gharibi R, Yeganeh H, Rezapour-Lactoee A, Hassan ZM. Stimulation of wound healing by electroactive, antibacterial, and antioxidant polyurethane/siloxane dressing membranes: In-vitro and in-vivo evaluation. Appl Mater Interfaces 2015;7:24296-311. Zahedi P, Rezaeian I, Ranaei-Siadat SO, Jafari SH, Supaphol P. A review on wound dressings with an emphasis on electrospun nanofibrous polymeric bandages. Polym Adv Technol 2010;21:77-95. Chaby G, Senet P, Vaneau M, Martel P, Guillaume JC, Meaume S, et al. Dressings for acute and chronic wounds: A systematic review. Arch Dermatol 2007;143:1297-304. Monaco JL, Lawrence WT. Acute wound healing an overview. Clin Plast Surg 2003;30:1-12. Liptak JM. An overview of the topical management of wounds. Aust Vet J 1997;75:408-13. Dorai AA. Wound care with traditional, complementary and alternative medicine. Indian J Plast Surg 2012;45:418-24. Lio PA, Kaye ET. Topical antibacterial agents. Med Clin North Am 2011;95:703-21, vii. Burrows D. Framycetin sulphate: A cutaneous antibiotic. Br Med J 1958;2:428-9. Ministry of Health and Family Welfare, Govt. of India. Ayurvedic Formulary of India. Part I. 2nd ed. New Delhi: Ministry of Health and Family Welfare, Government of India; 2003. p. 135. Sharma S. Ch. 19. In: Shastri K, editor. Rasatarangini. 11th ed. Delhi: Motilal Banarasidas Publications; 2009. p. 479, 483. Datta HS, Mitra SK, Patwardhan B. Wound healing activity of topical application forms based on ayurveda. Evid Based Complement Alternat Med 2011;2011:134378. Biljinder S, Jindal N, Bansal R, Kumar D, Gupta V. Antimicrobial potential of polyherbo-mineral formulation Jatyadi Taila – A review. Int J Res Ayurveda Pharm 2011;2:151-6. Thaker AM, Anjaria JV. Antimicrobial and infected wound healing response of some traditional drugs. Indian J Pharmacol 1986;18:171-4. Zaki AA, El-Bakry M, Fahmy AA. Effect of licorice on wound healing in rabbits. Egypt J Hosp Med 2005;20:58-65. Garg VK, Paliwal SK. Wound healing activity of ethanolic and aqueous extracts of Ficus bengalensis. J Adv Pharm Technol Res 2011;2:110-4.doi: 10.4103/2231-4040.82957. Rani MS, Dayanand CD, Shetty J, Vegi PJ, Kutty MA. Evaluation of Antibacterial Activity of Pongamia pinnata linn on Pathogens of Clinical Isolates. Am J Phytomedicine Clin Ther 2013;1:645-51. Raghu Ramulu D, Lakshmi N, Sri Rama Murthy K. Biological activity and phytochemical screening of the oleoresin of Shorea robusta Gaertn. f. Trop Subtrop Agroecosystems 2011;14:787-91. Vyas P, Prajapati PK, Shukla VJ. 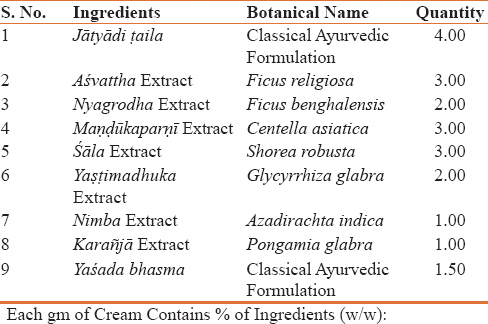 An herbal wound healing gel prepared with pachavalkala kwatha, nimba kwatha and kumari swarasa with their physicochemical parameters. Int J Phytother Res 2013;3:49-60. Nehete M, Nipanikar S, Kanjilal A, Kanjilal S, Tatke P. Comparative efficacy of two polyherbal creams with framycetin cream in treating fresh wounds. Eur J Pharm Med Res 2015;2:1047-57. Nehete MN, Nipanikar S, Kanjilal AS, Kanjilal S, Tatke PA. Comparative efficacy of two polyherbal creams with framycetin sulfate on diabetic wound model in rats. J Ayurveda Integr Med 2016;7:83-7. Patil P, Nagore D, Ambikar D, Patil M, Nipanikar S, Kanjilal S, et al. Evaluation of wound healing potential of various wound healing creams in fresh, diabetic and burn wound models. Eur J Pharm Med Res 2016;3:248-58.